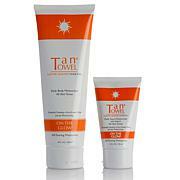 TanTowel® Express Tan 2 oz. 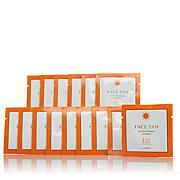 High-quality fiber towelettes that are pre-measured with tanning solution and best for fair to medium skin tones. Half-body towelettes are just right for arms or legs. 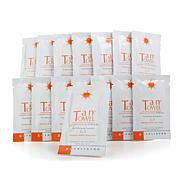 Unfold towelette and apply to clean, dry skin in circular motions over your body. Color will appear within 2 to 4 hours, and lasts up to 7 days. 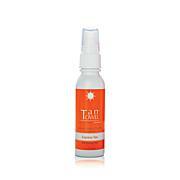 To maintain your tanned look, reapply as needed or 2 to 3 times per week. Ingredients: Ingredients: Water/Eau, Ethoxydiglycol, Dihydroxyacetone, Butylene Glycol, Polysorbate 20, Phenoxyethanol, Benzyl Alcohol, Sodium Metabisulfite, Potassium Sorbate, Tocopherol, Tetrasodium EDTA, Citric Acid, Fragrance (Parfum), Ethylhexylglycerin, Cucumis Sativus (Cucumber) Fruit Extract, Tocopheryl Acetate, Melaleuca Alternifolia (Tea Tree) Leaf Oil, Ascorbic Acid. the one product that doesn't leave streaks and is easy to use. Order them every year. Very easy to use no mess, no bad smell or odor. Dries very quickly once you apply and I bought the classic and it is very subtle. I have fair skin but may consider buying the next level of tan. I love tan towels. I have fair skin and these towels give me a natural, bronze glow. You may miss a few swipes on the first try, but you'll blend it all together the second day (second towel). It lasts a few days and is just the easiest way to tan in my opinion. This is the only self-tanning product I will use, and I've tried everything. I have recommended these towels to my friends, family and coworkers. Give these a try! i prefer the Classic because I am light-skinned. I have used the Plus but it is a bit dark for me. Both are very true in color and I have been using them for at least 10 years. 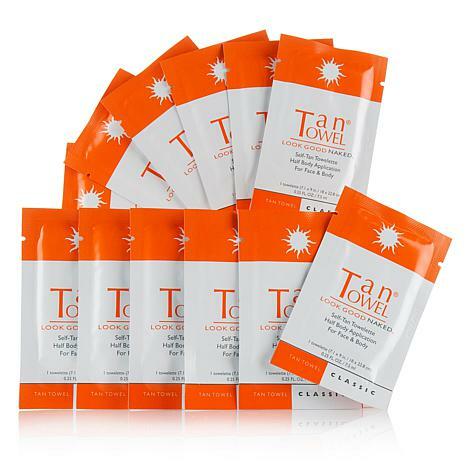 Other self tanners tend to be too dark or too orange. I get many compliments on my "tan" and many of my friends now use Tan Towels. Remind me about TanTowel® upcoming shows.